These resources are geared more to teaching grade school aged children than children's ministry in general. 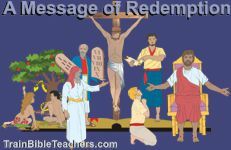 You might find the children's ministry resources page on the MinTools.com site helpful if you are looking for children's ministry helps. Does your children's class have the BLAs? Teach an Adult Book to Children? Why? Teach an Adult Book to Children? How? Teacher Training On the Go Book with CD by Group Publishing - They say the CD includes "15 audio training sessions. You have our permission to make cassette or CD copies of this CD and hand out the copies to the volunteers at your church. Each session is approximately five minutes...." on working with children. This PowerPoint presentation looks at how their developmental characteristics affect the way you teach the Bible to them. If you do not have PowerPoint installed on your computer, you can download a free PowerPoint Viewer from Microsoft's site. You can encourage teachers to download it as well if you wish to have teachers view it individually rather than in a group.